A doctor at the centre of an inquiry into a 'mystery package' delivered for Sir Bradley Wiggins has pulled out of a parliamentary hearing into the matter. Ex-Team Sky medic Dr Richard Freeman, who received the package on behalf of the team in 2011, will not appear before the Culture, Media and Sport Select Committee because of ill health. Ex-British Cycling coach Simon Cope, who couriered the package, will attend. UK Anti-Doping chief Nicole Sapstead is also set to attend on Wednesday. A spokesperson for the select committee said it will offer Freeman "the option of supplying written evidence and may call him to appear when he's well enough". The hearing had already been postponed by a week after Sapstead asked for more time because of a development into UK Anti-Doping (Ukad's) own investigation into the package. In December, Team Sky boss Sir Dave Brailsford told the committee that the package contained an over-the-counter decongestant, Fluimucil. 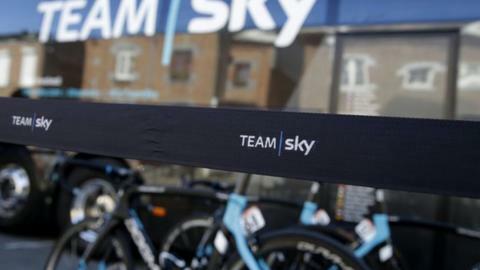 Team Sky says it is "confident" Ukad will find no evidence of wrongdoing. But Wiggins and Team Sky boss Brailsford have come under scrutiny since information on the rider's authorised use of banned drugs to treat a medical condition was released by hackers. Wiggins' therapeutic use exemptions were approved by British authorities, and cycling's world governing body the UCI. There is no suggestion either the 36-year-old or Team Sky broke any rules. Brailsford has said Team Sky can be trusted "100%", despite "regrettable" questions over Wiggins' medical records and the package delivered at the Criterium du Dauphine race in France in 2011. Wiggins is a five-time Olympic gold medallist, and in 2012 became the first Briton to win the Tour de France.